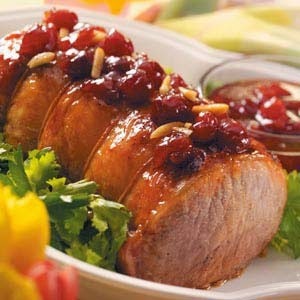 Note: Personally, as a diabetic, I do not add the extra cherry mixture to my plate when enjoying this roast. My recommendation is to use or not use based on your own blood sugar readings. Cherries do contain natural sugar. Sprinkle the salt and pepper evenly over the roast. Place on meat rack in a roasting pan and place, uncovered, in 325 degree oven for 2 1/2 hours. Meat should reach an internal temperature of 175 degrees. In a small mixing bowl combine the pie filling, almonds, and cinnamon until well blended. During the last 30 minutes of roasting, spread the glaze of the roast, reserving some to serve with the meat, and cover. Remove roast from oven and let stand 10 minutes before carving. Serve with the reserved cherry mixture. Next Green Chile Pesto and Roasted Chayote Squash Side Dish – Thanks, Rick!